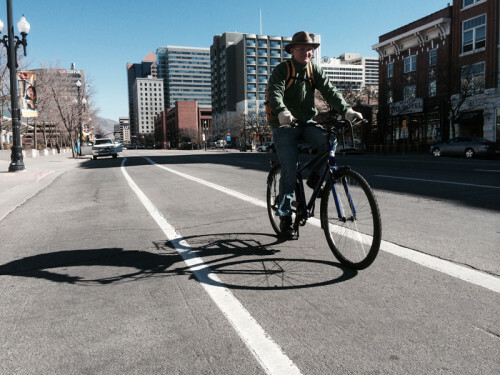 March 2, 2015 – Cycling Utah is proposing the 10,000 Wheels Initiative for Affordable Transportation for the Wasatch Front and Utah. Affordable transportation is crucial for Utah and in particular, Wasatch Front residents in order to get to jobs, the grocery store, appointments, school, and cultural events, and to participate in life in our modern world. The 10,000 Wheels Initiative for Affordable Transportation is a comprehensive transportation program that would be comprised of Affordable Bicycle Transportation, Affordable UTA Transit Passes, Greenbike Memberships, Affordable Vehicle Repair, a Bikes and Transit for Clunkers Program, and Walkable Communities Assistance. 10,000 Wheels would be designed to benefit low and moderate income residents of the Wasatch Front and the rest of Utah. The component programs could also be made available to all residents. Cycling Utah would like to call on Salt Lake City Mayor Ralph Becker, City Council Chair Luke Garrott and the Salt Lake City Council, the Wasatch Front Active Transportation Committee, Ogden Mayor Mike Caldwell, Salt Lake County Mayor Ben McAdams, and other local and state politicians to put in place a task force to study and possibly implement this proposal. Vision: Affordable Transportation (bicycles, transit, walking, and affordable vehicle repair) will be readily available to residents in need on the Wasatch Front and in Utah. i. Local Bike Shops through a partner program. GreenBike Bike Share (http://greenbikeslc.com ) memberships for low income workers through a referral or reference program. GreenBike Bike Share is a valuable and affordable transportation option in the downtown area, but is not readily accessible to those without credit cards or bank accounts. Create a Commuter Program – Assistance with other necessary equipment and training for bicycle commuting. And, a potential return of the SmartTrips Program (Salt Lake City). vii. Basic Mechanical Training such as flat repair, seat adjustment, and wheel removal. Affordable Transit – UTA (http://rideuta.com ) Transit vouchers and passes for low and moderate wage earners. Affordable Vehicle Repair – assistance for those in need in order to improve gas mileage and air quality. This is an existing program through Salt Lake County (http://slco.org/mayor/issues/improving-air-quality/ ). Bikes and Transit for Clunkers Program as part of the Affordable Vehicle Repair Program. Trade your car for a commuter bike and a transit pass if a pledge is made to not purchase another car for 1 year or more. Since the average yearly cost of owning a car is $8876 (http://www.rita.dot.gov/bts/sites/rita.dot.gov.bts/files/publications/national_transportation_statistics/html/table_03_17.html ), this may improve finances for those that choose to participate. Walkable Communities Assistance – route planning, housing choices, transit choices, and appropriate equipment for walking as transportation. Cycling Utah will be contacting local transportation officials, government officials, and advocates to present this proposal. We will report on the progress. One Response to "Cycling Utah Calls for 10,000 Wheels Initiative for Affordable Transportation in Utah"